For almost two decades, Jamie Oliver has been arguably the world’s most well-recognised celebrity chef, with the charmingly affable Englishman spreading the gospel of simple, delicious and healthy gourmet meals to the average man and woman. Jamie’s Italian, his worldwide chain which has spawned more than 30 restaurants, has found fame and acclaim for doing the same – simple, delicious signature Oliver recipes, perfectly executed; sustainable ingredients; and an affordable, accessible price point – and it’s a formula that he’s now looked to bring to Hong Kong, one of the most competitive dining scenes in the world. Having just opened, the lines are, as expected, long. But when we visit just after their grand opening, the staff – who are friendly and efficient – offer us long planks of olives and cold cuts to pick at. The décor stays true to the franchise, consisting of low lighting, intimate tables and a kitchen that extends out into the dining area, where you can hear the clang of pots and the shouts of chefs – though not the British accent of Oliver himself. We start with the sweet mini chilli peppers ($60) which are bite-sized and stuffed with tuna. The peppers aren’t naturally sweet enough to divert away from the taste of canned tuna, but mopping it up in the balsamic vinegar helps it along. We’re chuffed with the half portion option of pastas, giving us the chance to try a few more of the fresh-made noodles. The pumpkin panzerotti ($80/135) is delightful, the parmesan really brings out the sweetness of the squash and pumpkin filling, further enhanced with a smattering of amaretti crumbs on top. And what could go wrong with the truffle tagliatelle ($75/125)? With fresh truffle, parmesan and al dente pasta, the ingredients speak for themselves. Sadly, things go downhill from here. 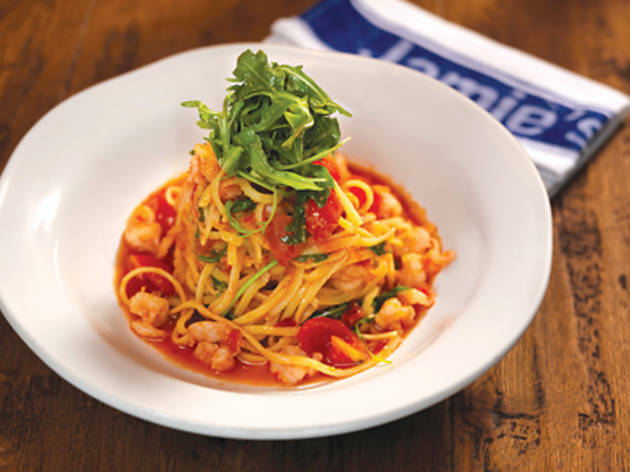 The famous prawn linguine ($100/165) pictured above, which is not only known within the context of the restaurant but also a touted recipe that graces the pages of Jamie’s recipe books and apps – is a bust. Again, the pasta is top notch, but the prawns are small, measly and rubbery, almost like it’s an afterthought rather than the major ingredient. In fact, we know we did a better job ourselves making this dish at home, and we expect something better at a restaurant. We know that sourcing sustainable seafood is important to the franchise, and that may explain the sad size of the shrimp, but should this be at the cost of the dinner? A compromise seemingly needed to be made with the dish – to increase the cost, reduce the shrimp-size, or simply not serve it at all – and we’re not sure the right one has been made. We’re not asked how well we want our lamb cooked when we order our lamb lollipops ($220), so we’ll assume there’s a standard serving, and though the condiments of crushed nuts and dipping yoghurt work well with the lamb, it’s a horrible cut where half the chop is fat. It’s up for contention just how rare lamb can be served, but when we’re not given an option to choose, and it’s served thinly seared and red raw in the middle, then a better cut of meat is in order. The side of polenta chips are a signature item that we have fond memories of from Jamie’s Italian elsewhere, but these are also disappointing. The chips are served the size of some British potato chips – like a Duplo block. Our serving is so big that even with ample seasoning, all we taste is mushy polenta. Dessert is important to us and a good one can be a restaurant’s saving grace. Unfortunately this didn’t happen either. The Epic Brownie ($65) – with its boisterous name – is so extremely underdone, that it had a problem holding itself together. Its viscous texture, clings to the roof of our mouths, and when served with caramelised popcorn, ice cream and fudge sauce, leaves a saccharine taste on the palate that won’t go away. 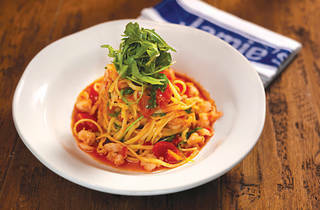 Jamie’s Italian 2/F, Soundwill Plaza II, Midtown, 1 Tang Lung St, Causeway Bay, 3958 2223; jamiesitalian.hk.